LANGWARRIN have battled hard to secure an upset victory against Karingal at Lloyd Park in MPNFL Division Two football on Saturday. The Kangaroos started quickly and put themselves in the box seat with a dominant first half, thanks in part to a standout performance in the ruck from Matt Naughton, who gave his midfielders first use of the ball all day. Langwarrin were smashing Karingal through the middle, dominating centre clearances and barely giving the Bulls a look in during the first half. Karingal’s frustration was starting to show as Aaron Paxton was sent off the field after a heated scuffle and verbal confrontation with the umpire, much to the delight of the Langwarrin crowd. With the game rapidly getting out of reach, Karingal had to have a big third term to stay in touch, and they certainly did. The Bulls finally showed the quality that got them to second place on the ladder and closed the margin to just two goals at the three-quarter time break. The task of holding on to the lead was also made more difficult by the fact that Langwarrin were reduced to just one man on the interchange bench, with the biggest blow being the loss of playing co-coach Blake McCormack who was stretchered from the field after a huge head knock. Up against the odds in the final term, Langwarrin fought valiantly to hold onto their lead, and ended up taking out a brave victory over Karingal 12.17 (89) to 11.5 (71). Matt Stanley was the standout performer for the losing side, as he booted five goals at crucial times to keep his side alive. Blake McCormack, who appeared in good spirits after his injury scare during the game, said he was optimistic about how his side could run out the rest of the year. “It’s fantastic to see where we’ve come from since the start of the season to now. We’ve got good support around the club which makes your job super easy as a coach. We’re super proud of the lads and their challenge for the finals,” he said. Langwarrin were also inspired by the news that they had closed the gap on fifth place Hastings, who fell to Rye at RJ Rowley Reserve. In difficult conditions, Rye absolutely blitzed Hastings in the first term with a stunning eight goals to one display. Despite being put on the back foot early, Hasting enjoyed a much more fruitful second term, as they took advantage of kicking to the scoring end and cut the lead to three goals at the half time break. The see-sawing contest again fell in Rye’s favour in the third term, with Hastings held to just one behind and the lead blowing out to 39 points. Despite a late fight back, it was a case of too little too late for Hastings, as they succumbed to an impressive Rye outfit 13.9 (87) to 9.17 (71). Adam Kirkwood was the star player on the day, as he kicked four goals in a best on ground performance for Rye. 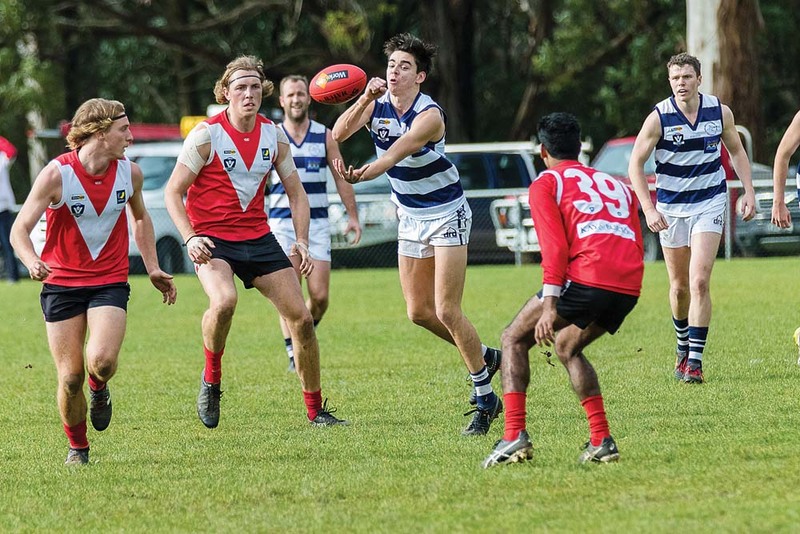 At Pearcedale Recreation Reserve, Pearcedale put on an impressive performance against Devon Meadows in front of a bumper home crowd. The main drawcard for the day was Pearcedale’s new signing, as former AFL All Australian and North Melbourne forward Drew Petrie made his debut in a one off appearance for the club. The cameo deal is similar to the one that saw Barry Hall play a game in Pearcedale colours last season. Petrie got the crowd involved with an early goal, but largely played second fiddle as his teammates stole the show. Pearcedale held a seventeen point lead going into the final break, but the game was still not dead and buried. With Devon Meadows threatening a fight back, Petrie made a move into the ruck to help stem the flow, and the tactic worked effectively. Pearcedale had to survive a late scare, but ended up running out eight point victors over Devon Meadows 10.8 (68) to 9.6 (60). At Red Hill Recreation Reserve, Red Hill took on Chelsea in a highly anticipated clash of third against fourth. Although it looked on paper to be an even contest, unfortunately the game was fairly one sided right from the outset. Red Hill proved to be the more effective team in the wet, as they frustrated the Seagulls by holding them to just two goals in the first half. Chelsea were helped by a four goal performance from Curtis Bywater, who took his tally for the year to 39, but in the end it counted for little as Red Hill proved too strong, claiming victory 12.6 (78) to 6.5 (41). It was business as usual for Dromana as they took on Somerville, but they had to survive a big early scare first. Top of the ladder Dromana have hardly put a foot wrong all season, but were shell shocked as Somerville held them goalless in the first term to take a 16 point lead into the quarter time break. Suddenly faced with an unexpected challenge, it didn’t take long for Dromana to correct their course and gain the lead. By half time they held a five point advantage, and that lead only grew as the day went on. Sam Fowler and Ethan Johnstone impressed for Dromana with five and four goals respectively, as their side ran out convincing winners 15.17 (107) to 8.6 (54). The final game for the weekend saw two sides planted to the bottom of the ladder face off, as Crib Point played host to Tyabb. The Yabbies looked the more dominant team in the first quarter, but couldn’t convert that into dominance on the scoreboard as they kicked a disappointing one goal and eight behinds. Tyabb’s inaccuracy looked to be proving their own downfall, as Crib Point stayed in touch and went into half time with a one point lead despite having fewer scoring shots. Tyabb fought hard in the second half, but were almost made to pay for their earlier inaccuracy. It wasn’t easy, but the Yabbies eventually claimed the win over Crib Point 6.11 (47) to 8.16 (64).